Add half the tub of pesto and a sprinkling of freshly ground black pepper to the pan and bring back to the boil. Pour the sauce over the mussels then spoon over the remaining pesto straight from the tub. Serve immediately with a crusty baguette, to mop up the juices. The mussels will serve 2 adults as a main course. 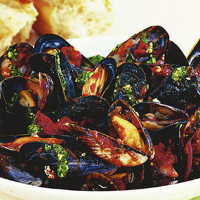 Until you are ready to cook them, keep the cleaned mussels in a covered bowl in the fridge.